> Events in Florida > 4th Annual Magical Christmas Masquerade Ball-Stars, Stripes Action! 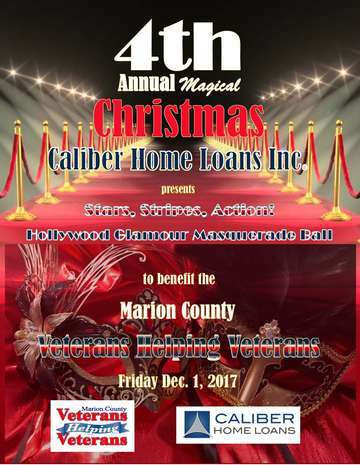 Caliber Home Loans and Jinky Diaz invite you to the 4th Annual Magical Christmas-Stars, Stripes Action! with nothing but open hearts, a memorable evening, and blessings to share. All of this joy and fun will be benefiting the veterans. We hope to make them feel as though their effort is appreciated, their hard work acknowledged, their sacrifice worth it, their contribution unforgotten. We look forward to welcoming you to a magical evening of honoring those who made our present possible and our future more promising. That isn’t all the event has to offer; the evening will also be filled with live entertainment by Mark Raisch, DJ Casey, a cash bar, live auctions, raffle draws, a delightful dinner, networking and much more - all to benefit Marion County Veterans Helping Veterans, Inc.
Marion County Veterans Helping Veterans, Inc. (Vets Helping Vets) is a 501(c) (3) not-for-profit organization serving veterans and their families throughout Florida. Hank Whittier, the CEO of Vets Helping Vets, had a vision, a one-stop-shop for our veterans. On May 24, 2017 the vision became a reality. The result is the Veterans Resource Center, the first in the State of Florida located across the parking lot of the Veterans Memorial Park. Since 2002 Marion County Vets Helping Vets has helped our veterans with many services including financial assistance, counseling and making it possible for them to maintain their independence and dignity. Friday, December 1 2017 from 7 P.M. to 10:30 P.M.
We would like to receive the donations by November 10, 2017.